Image: A stylized, explosive ball of flame takes up most of the background, descending upon tall buildings that seem to circle the area. The title of the book and the author's name are in thin, black script across most of the ball of flame. Small helicopters near the upper corners patrol a smoggy sky. In the foreground at the bottom of the image, two people stand: A woman with bright pink hair, purple dress, with her hands on her hips, and the other, a bald reptilian man in a black tank top. Parole is a crumbling city that is constantly burning and closed off from the rest of the world. Its inhabitants have powers both great and terrible, but everyone fears two things: Parole someday tumbling into the fire underground, and Eye in the Sky, the government surveillance. Evelyn and her wives Rose and Danae are part of the resistance, a movement to keep citizens safe and Parole standing. 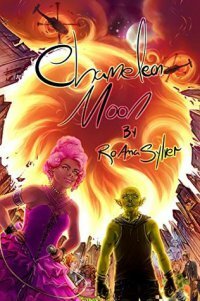 When Evelyn bumps into Regan (a reptilian man with amnesia), things are set in motion that will test the city and its heroes, if it doesn’t kill them first. Let me get this out of the way: Amnesia and dystopia/totalitarian regimes are tropes I’ve read a lot. So much, in fact, I groaned inwardly when I found out this book had them. Not again, I thought to myself. But, this book is more than I first gave it credit for. The characters are diverse, caring, hopeful, badass, and realistic. Evelyn and her family are so sweet together and you can tell the three women love one another and their son. Regan longs for the feeling of love and acceptance he sometimes finds, just out of reach in his lost memories. Zilch is a nonbinary (stitched together) person looking for their heart. Even secondary characters are given adequate detail and personalities. Everyone can (and does) fight for what they love and believe. Parole is populated with people of a variety of skin tones, sexual orientations, disabilities, neuordivergences, superpowers, and places on the gender spectrum. Villains are sometimes harder to pin down than one would think. Parole is a vivid setting. The details are plentiful but don’t bog down the story in any way. The buildings inside Parole are adequately described, but the city itself is the real star with cracks in the sidewalk, constant smoke in the air, the white noise of helicopters always patrolling. I could see it clearly in my mind. The stakes felt high and the pacing was good. Though it seemed like there might be a little too much “down time” for the characters at points, even that is essential because of the novel’s tone. One of the things I liked most about this novel is the hope in it. The characters face horrors every day (no one in Parole comes away without anxiety, PTSD, or depression) but everyone still loves and dreams. Our heroes strive to make a better city than the one they fell asleep in. There is emphasis on chosen family and acceptance, just as you are. A few things to be aware of: This book features a drug that is addicting and sometimes fatal, though no detailed descriptions of someone taking it. There are descriptions of characters burning and an instance of torture. And, the book ends with things unresolved (there is a sequel out right now). What Would an Organization of "Us" Entail?